Shyam (name changed) is a migrant worker in Mumbai, India. 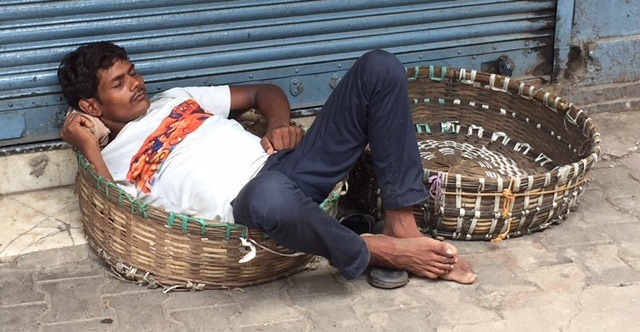 He works as a daily wage earner, lifting goods from shops and dropping them to nearby places carrying the load on his head in his wicker basket. When he gets tired, or in between the load lifting and dropping trips, he takes a nap in his wicker basket but only till his phone rings and he gets the next call. Maximum weight he can carry is no criterion. He takes as much as he can handle. With the load, he walks up to 5-6 kilometres and sometimes also climbs the stairs in buildings that have no elevator. I met him in my recent trip to Mumbai and he was kind enough to speak to me about his life. He earns around Rs 1000 (approximately USD 14) a day. At the young age of 28 years, he has started having pain in his neck. He misses his family and the comfort of home. Why did he migrate then? In his home town in Bihar ( another Indian state), he was not able to earn even Rs. 100 a day. He would then be counted among the 800 million who live in extreme poverty globally earning less than 1.9 dollars a day. Poverty and lack of opportunities at home make people like Shyam migrate to other places. They may earn a bit more but face several challenges and hardships. This proves that increasing income is not enough. Working conditions, occupational safety and health, education and other social services are critical to ensure that people have a good quality of life. Shyam was in my mind as I conducted the session “leaving no one behind” in the 2030 Agenda for Sustainable Development in an international training progrmame this week in Turin, Italy. We discussed why certain groups – women and girls, migrants, youth, persons with disability, persons living with HIV, indigenous and tribal persons – are being left behind. They are often amongst the extreme poor; they face discrimination on several grounds; and as a result they also have low access to education, health and decent jobs. The sustainable development agenda envisages that the development goals should be met for all nations/people and for all segments of society. Each country is supposed to identify the groups that are being left behind. I hope people like Shyam will be taken note of as countries implement their plans and make an attempt to reach out to those who are the furthest behind. There are very few people who can give young people precise, practical and inspirational advice. Dr Amrita Dass is one of them. She is the Founder-Director of the Institute for Career Studies, (ICS International), Lucknow, India. I recently watched her in a 2.5 minute TV interview where she gave some profound advice to youngsters who are completing their final school exams and getting ready to enter college/university. 1. How can one make the best of his/her university life? Dr Amrita Dass: Students need to bring together capability, copability and responsibility. Capability is enhanced if the undergraduate courses they have chosen resonate with their aptitudes and interests. Self-discipline, effective time management wherein students prioritise the ‘musts, shoulds and coulds’, maintaining good relations, leisure activities, a nutritious diet and a positive attitude are the essential building blocks of copability. Responsibility encompasses meeting all your commitments to the best of your ability, being dependable and accountable for your actions. Moreover, during under grad studies, students should explore possibilities of internships as this will give them valuable insights into the world of work and develop the essential employability skills. The Association Internationale des Étudiants en Sciences Économiques et Commerciales (AIESEC) is a global organisation with a strong presence in colleges and universities that provides such opportunities. 2. If you don’t like the course you get the admission in, what can you do? Dr Amrita Dass: There could be many reasons for not liking the course you have got into. You may find that the teaching is not up to the mark, or the classes are not held regularly or the overall environment is not conducive and you are finding it difficult to adjust or you are in a city, far away from home and homesick. Remember that you are not the only one facing such problems which I would describe as “teething problems” and therefore temporary. Become an intrinsically motivated learner by reading reference books, researching and doing project work. Make new friends, participate in extra-curricular activities by joining a society/club in your college and seek avenues that will tap your potential to the fullest. I believe that “when the road gets tough, the tough get going”! However, if the course is one that you had not really explored and you discover that it does not gel with you, then the earlier you opt out in favour of the right course at the right campus, the better! 3. If one does not get admission in the desired course, is it OK to take a gap year? If yes, how to make the best of the gap year? Dr Amrita Dass: Please avoid taking up any course that you are offered randomly as this will not tap your potential to the fullest. A gap year is advisable if you are not sure about what course you wish to pursue or have not managed to get the course of your choice at a leading campus. There are many ways to make your gap year a meaningful and enriching one. You could, for example, pursue some interesting free online courses delivered by eminent faculty through coursera.org. Alongside, you could take master classes to hone your talent in art and design, music, dance, acting, culinary arts or sports etc. A gap year could also be utilised for community service which is a huge learning experience and also adds value to your application to top universities, or internships to provide insights about careers you are exploring. Before I close, I want to share what Dr Dass had told me years ago, “If you have good communication skills and a positive attitude, no one can stop you from achieving your career goals”. This has remained a mantra of life for me. I would like my young friends to work on improving their communications skills and developing a positive attitude. In my previous post — Have Sight, Lack Vision — I stressed that we need to alter the way we look at things and explore solutions. Availability of, or lack of, resources should not be the guiding force when we explore solutions to problems. Unfortunately, what happens is just the reverse. We often hear of politicians and statesmen talking about the huge sums of money required to address the problems that the world is facing in the domains of health, education, poverty, or climate change. What happens in such a scenario is that resource constraints limit our ability to explore low-cost and affordable solutions. The poor state of school infrastructure—lack of chairs and desks, toilets, electricity etc —in developing countries is identified as a major factor in the achievement of educational goals for young boys and girls. One of the targets of the Sustainable Development Goal 4 is to : build and upgrade education facilities that are child, disability, and gender-sensitive and provide safe, nonviolent, inclusive and effective learning environments for all. In India, Aarambh – an NGO in Maharashtra used old cardboard boxes to create school bags that transform into desks. Aarambh identified a problem- Childen were sitting on floor and writing. This affected their posture and learning. And they found an affordable solution. They used old discarded cardboard to create school bags which unpack into small desks. This laudable work can be seen here. I wonder why don’t governments build on such innovative ideas, instead of running after the money and delaying action. It is extremely important now that we have the 2030 Agenda for Sustainable Development with 17 goals to be achieved by 2030. Will there be enough money to adequately fund all SDGs?— is the question daunting all. The mad race for securing resources has begun for different SDGs as if they are competing priorities. All goals are important and inextricably linked. What is important is to see their inter-connectedness. The need of the hour is to identify and scale up the solutions that have worked instead of delaying action till all the necessary resources are secured. Ever seen a class that brings together a 30-something mother and her 9-year-old son?…a class that includes children and adults of different ages and cultural, religious and economic backgrounds? …a class where students pen poems, learn about world events and discover themselves? Well, such a class is run twice a week in Bhendi Bazaar, Mumbai, India, on the premises of a local school, thanks to the voluntary efforts of an old couple — Mr. and Mrs. Haider. They have been running it for a number of years now, under the aegis of Aboo Mohammad Trust. It is difficult to imagine what would be the purpose of such a heterogeneous class. While the primary objective is to help pupils improve their spoken English, it does much more than that. It enhances their general awareness, keeps students focused on their career goals and builds their confidence, self-worth and public speaking skills. The class is fortunate to have a soft-spoken, caring and inspiring teacher in Mrs. Khan. Over nearly two decades and a regular commute from quite a distance, Mrs Khan has been enthusiastically teaching each session with a blend of current affairs, vocabulary and warmth. I have been visiting this class for a few years now and I can see a marked improvement in the group. The once-shy students, grappling with a new language, now eagerly share their knowledge on the topic of the day and jot down new words and information. This year, too, I visited the students, along with my family, in August. Whenever we visit, Mrs. Khan asks us to speak to her students. We had a good interaction with the students. They asked intelligent questions, such as the difference between education systems in India and Switzerland. This revealed their curiosity to know the world. I also invited them to speak and share something about themselves. One by one, they spoke about their studies, hobbies, their family and career goals. We were also joined by Mr. Zubair Azmi, who is another great support in this effort. Mr Azmi is the Director of Urdu Markaz (Urdu Centre), a Bhendi Bazaar-based cultural centre dedicated to the promotion and appreciation of Urdu literature. He has graciously made available his organization’s space for the class. He is closely involved, knows the students and motivates them to hone their talent. Based on his encouragement, some students demonstrated their talent before us. We were impressed to hear a poem written by one of the students. The title of her poem was “Beti” (‘Daughter’) in which she beautifully captured the sentiments of a girl child and the discrimination she faces. While all this interaction took place, Mr. Haider sat behind smiling. Behind the smile was certainly the satisfaction of seeing the fruits of his dedicated hard work. I must add that the activities of Aboo Mohammed Trust are not run with any donor’s support. Despite health and age not being on his side, Mr. Haider continues to serve the community. Seeing his sincerity and dedication, he is joined by several community volunteers, including doctors and teachers. Health camps are organized for the poor, nursing classes are organized for young women, in addition to the regular language classes. He makes an attempt to inform people about government services and helps them access the services. He does whatever he can to serve people in his area with the help of his wife and several community volunteers. I wish him health and a long life. His ideas and projects are doing a yeoman’s service for the community. I asked Mrs. Khan how she joined this effort. She said, “I came to know about Haider saheb’s work from a newspaper and phoned him to inquire how I could help. It has been over 17 years that I have been teaching here… it has changed my life….these are the golden years of my life.” Mrs. Khan is very humble to say this when in fact she has touched so many lives. What a great example of dedicated community work! This voluntary effort may not be slotted under the category of `good practice` in the journals of the development sector, nor be presented at conferences, but this effort is certainly a great practice. May God bless all those who are a part of it.